Constance was born on the 23rd of September 1914 in a terraced house on Dene Road in the Suffolk town of Lowestoft. She was the eldest of two children born to Lawrence John Rackham, a Dairy Farmer, and his wife Constance Sophia (nee Balls). She was baptised privately at Holy Trinity Church in Gisleham(1) in Suffolk on the 2nd of December 1914, receiving a Bible as a baptism gift. Soon after she was born, the family moved a short distance to a large house on Station Road. The house, which is still standing, had a very large side garden in which two modern houses have now been built. At some point during WW1, the family were evacuated to Kessingland, which is a few miles south of Lowestoft, where they lived in a house called 'The Homelands'. After the war, in 1919, the family moved again, this time to 'The Chestnuts' in Black Street, Gisleham - a property that had been occupied by her maternal grandparents Samuel and Mary Balls, who had just moved into Carlton Hall. Constance attended a Private School in Lowestoft, where she was a weekly boarder. On leaving school, she worked as an Assistant Matron at the Glenalmond Public School for Boys, which is located a few miles west of Perth in Scotland. 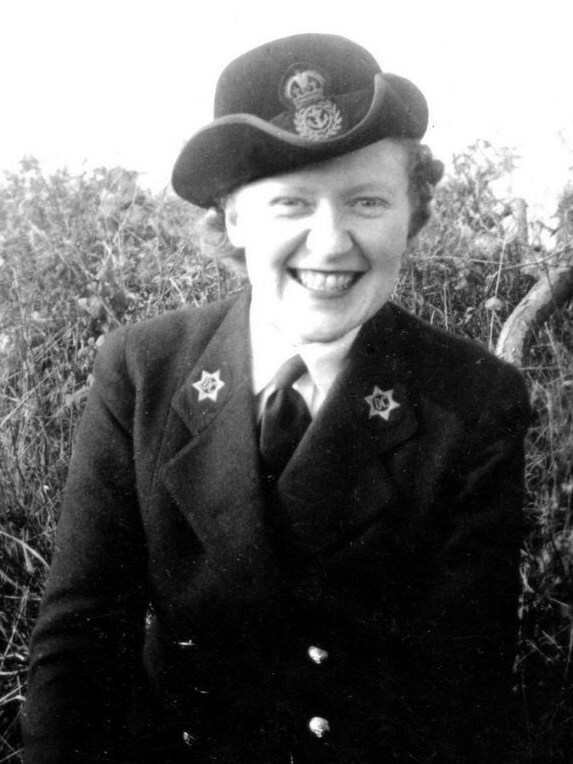 However, as the threat of War developed, in July 1940, Constance enlisted in the Womens Royal Navy Service (WRNS). Joining as a 'Wren' with a service number of 3600, she progressed quickly through Leading Wren, Petty Officer to Chief Petty Officer. Her speciality was as an Officers Cook. From July 1940 until mid 1943, Constance served as an 'Officers Cook' at HMS Europa(2) based at Sparrow's Nest in Lowestoft. The site of HMS Europa, which once belonged to Robert Sparrow of Worlingham Hall nr Beccles, was requisitioned by the Royal Navy on the 23 Aug 1939. and became the central depot of the Royal Naval Patrol Service whose main duty was Minesweeping using small ships including many from the local fishing fleets. One day, early in 1943, a Sergeant called Joseph Bougard, who was serving with the Belgian 'Brigade Piron', came to see her. He had been taking part in a military exercise at HMS Europa, and had injured a finger. Constance, who had been trained in first-aid, put a splint on the finger and took him to see a Doctor. Whilst the Doctor was examining the finger, which was broken, Joseph fainted. A friendship developed and a few months later, on the 3rd of September 1943, they married by Licence at a Register Office in Portsmouth. Constance's father did not approve of the marriage, which might explain why the witnesses to the marriage, were two of Joseph's friends from the Brigade Piron. Constance was recommended for a Commission and on the 3rd of July 1943 was promoted to Acting Third Officer and transferred initially to Greenwich (Painted Hall). She later served at HMS Daedalus (Lee-on Solent), HMS Daedalus II (Newcastle-under-Lyme), HMS Quebec (Inverrary, Scotland), and at HMS Collingwood in Fareham during the D-Day preparations. Constance and Joseph had three children; Michel, Anne-Marie and Louis. The family initially lived in Foxton and Shepreth, in Cambridgeshire, where Joseph was working in Agriculture. However, they eventually settled in Royston, Hertfordshire. After Joseph died in December 1981, Constance moved into a small bungalow in Royston but then bought a bungalow in Southwold on the Suffolk coast, her county of birth. Constance died on the 1st of March 1993 at the age of 78, having spent a couple of years in a Private Nursing Home in nearby Reydon. A funeral service was held at St Margaret's Church in Reydon on the the 5th of March, followed by a cremation. The ashes of Constance were scattered at sea off Southwold, by her three children, Michel, Anne-Marie and Louis. (1) Holy Trinity Church in Gisleham was close to the home of Constance's maternal grandparents, Samuel and Mary Balls.